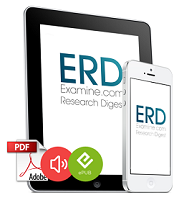 Ask Dr. Andro: What Are Human Equivalent Doses (HED) and How Do I Calculate Them? different reactions to identical treatments. I won't waste too many words on this being a new series on the SuppVersity, I suppose the name "Ask Dr. Andro" is self-explanatory. It is based on questions posted in the comment section that are relevant for the majority of the visitors and require and deserve a more sophisticated response. So, if you want your question answered, learn a lesson from "Learner" who posted the following question in the comment section of "Spicing Up Fat Loss: Structural Similarity to Melanocortin-4 Agonists Powers Piperine's (Black Pepper Extract) Fat Loss and Lipid Lowering Effects". Question from "Learner": Why is the mg/kg dosing ratio different for humans than rats, and does that vary by the agent? Notwithstanding all these benefits, as a faithful visitor of the SuppVersity you will be familiar with the problems that arise in interpreting data from studies conducted on one species in view of expected results of similar experiments conducted with another species. 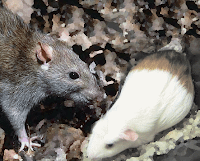 Even rats and mice can react very differently to a given substance and despite their similar weight and seize guinea pigs and rat models can by no means be used interchangeably. But let's get back to the "human equivalent" - obviously, two of the most apparent differences between human beings and rats, are body size and body weight. As you probably know, most studies provide information about dosages relative to body weight, so that, for the reader, the difference in body weight would not matter, anyways. Unfortunately a direct translation of the effects observed in a rodent model to a human scenario, based solely on body weight turns out to be very misleading. Example 1 (this is how it is not done): A very prominent example, where the futile effort of calculating human equivalent doses simply by multiplying the given dosages with the weight of an average human being, lead to major (public) confusion, were the studies on the beneficial effects of the red wine polyphenol resveratrol by Joseph A. Baur et al. (Baur. 2006) and Marie Lagouge et al. 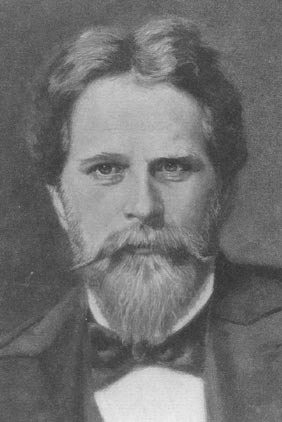 (Lagouge. 2006) that were interpreted by the "laypress" as meaningless, because the purported "equivalent" dosages (as mentioned before, calculated solely by multiplying the dose used in the study by the weight of an average human being, cf. figure 1) would amount to hundreds, if not thousands of liters of red wine per day. Figure 1: Example of a simplistic (and inappropriate) calculation of the human dose equivalent. This procedure, apparently fails to take into account that oxygen utilization and caloric expenditure are much greater in rodents than in human beings, or in other words: rodents burn through food and metabolize drugs, supplements and whatever you feed them much faster than humans. In the very extreme this may mean that what is a very small dose kilogram per kilogram for a mouse, may well kill an adult human being within minutes. Thanks to the meticulous research of the German scientist Max Rubner (Rubner. 1883), we do yet know that, in most mammals, both oxygen utilization and caloric expenditure correlate quite well with the ratio of the surface area of the critter to its body weight. An average laboratory mouse, for example, has a very small body weight of ~20g and a comparably large surface area of roughly ~0.006m². An average, normal weight male human being (height 1.73m), on the other hand, weighs roughly ~70kg and has a relatively small surface are of ~1.9m². This means that a man weighs about 3500x as much as a mouse, yet his surface area is only 316x larger than that of the small rodent. You may now ask yourselves how all that relates back to energy expenditure and metabolic rate - well, no matter how thick the fur of the mouse may be, there is no way for the little critter to escape the basic laws of thermodynamics, which state that the heat flow (for the mouse heat loss) across the surface of an object is proportional to its surface area. On a pound per pound base, the mouse will thus expend way more energy than the man just to keep its body from cooling down. With that being said, it should be quite obvious that the ratio of body weight [in kg] to surface area [in m²], the so called Km factor, can be used as a relative measure of the metabolic rate of an animal. Using the previously given data, we can now calculate Km factors of Km =3 and Km=37 for mouse and man, respectively. Then, the ratio of the two, Km(mouse)/Km(man) = 0.081 = 8.1%, indicates that the human metabolism runs at 8% of the metabolic rate of a mouse, or in other words, mice metabolise whatever supplement or medication you feed or inject them at a 12 times higher rate than human beings. If you compare that to the respective respiratory ratios of 165 breaths per minute for mice and 12-20 breaths per minute for healthy adults, the aforementioned correlation between body weight and surface area on the one hand and metabolic rate and oxygen consumption on the other becomes quite obvious. Where the term in (mathematically unnecessary brackets) would be a conversion factor given by the ratio of the Km value of the species that was used in the respective study to the Km value of the target species. For the majority of the studies you will find on the SuppVersity, the original study was done on mice (Km = 3) or rats (Km = 6) and the conversion factors which are probably of greatest interest for you, i.e. the ones for humans would be 3/37=0.081 for mice (cf. discussion above) and 6/37=0.162 for rats, respectively. the amount of pepper corns you would have to use to achieve the "same effect" in human beings. A final word on the italicized "same" in what would otherwise be the last sentence of this article: You will probably never see identical effects across different species, regardless of how exact you try to calculate the equivalent doses. There are simply too many differences between mice and men and the way they metabolize different substances to be able to translate results from experiments with oftentimes fundamentally different agents from mice to men and vice versa using nothing but the ratio of body weight to surface area as your guide. 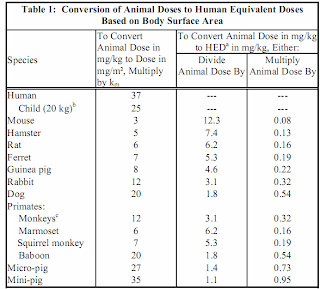 Consequently, you should consider human equivalent doses as a means to interpreted whether or not animal data is practically relevant and what amounts of a given substance would roughly have to be used in follow up studies to evaluate whether or not the results can be reproduced in human beings.